Campaign resources: Minutes, consultations, reports etc. FoLoB AGM November 2016. Reports & Minutes. Aston Library is due to close on 31 March 2017, as part of a package of cuts to the community libraries proposed by Birmingham City Council (BCC). The consultation period for the package ends on 31 January, so if you object to losing this library, you need to take action soon. The building which BCC rents for Aston Library is up for sale. Rather than find another location in Aston, BCC prefers to close it on the grounds that Birchfield Library is ‘only’ a 20 minute walk away (that’s a 40 minute round trip), and so would be a reasonable replacement for Aston Library. Are you happy with this? One of the points made to us frequently during this consultation is that for many, the location of a community library is as important as the facilities it offers. Aston Library – described by BCC in its report as ‘well used’ – is embedded in the community it serves. People can walk to it from their homes, parents are happy to let their children walk to it to browse and do homework, it is not too far for many elderly people and some people with disabilities. This would not be the case if the nearest library was Birchfield. There is no benefit in providing a ‘better’ library for a community if it is not within manageable reach of many of its residents. We have suggested that instead of putting Birchfield in the most highly resourced Tier 1, BCC should find another location for a library in Aston and fund them both at Tier 2 level. What can you do to try to keep a library in Aston open? ‘We have done the best we can to protect the city library service; the cuts could have been worse’, is the view of the Council leadership, and ‘the problem is caused by the huge cuts to the Birmingham rate support grant from central government, causing acute financial difficulties for the council’. The Friends of the Library of Birmingham are well aware of the year-on-year assault on Birmingham’s local government finance. However, we cannot accept that this new cut of £1.9 million to the city community libraries is justified and we are calling for it to be rejected. After all, this is a relatively small amount compared to the size of the council budget. 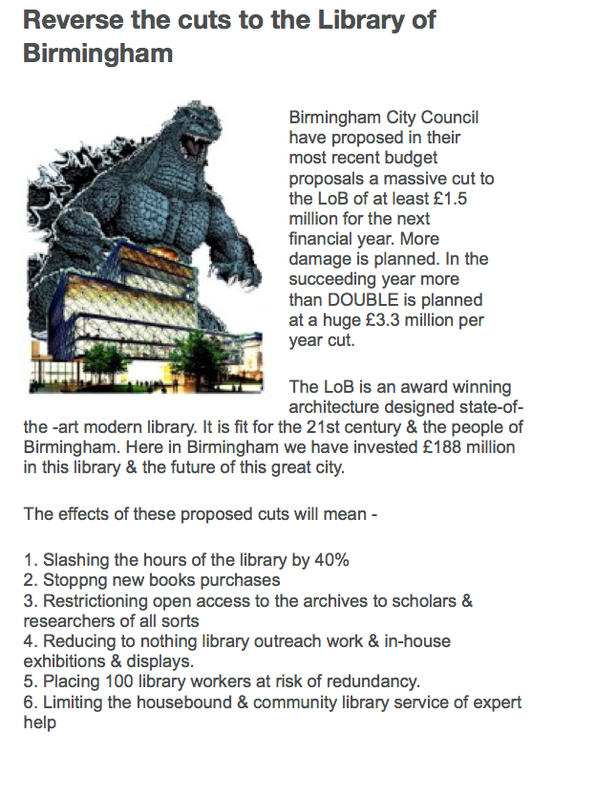 Alongside the big cuts to the new Library of Birmingham, which has seen a hundred of its staff being sacked and the loss of a whole floor, another important aspect of the cultural life of the city is being wound down with these new attacks on the community libraries. Twenty four full-time-equivalent library staff posts are projected to be lost, two libraries are set for closure and the opening hours of many others are set to be restricted, with reduced staffing, often in smaller and shared accommodation. A number are set to be run by community groups and volunteers. A vital public space for literature, learning and study is to be further restricted. This is unacceptable and has to be resisted. 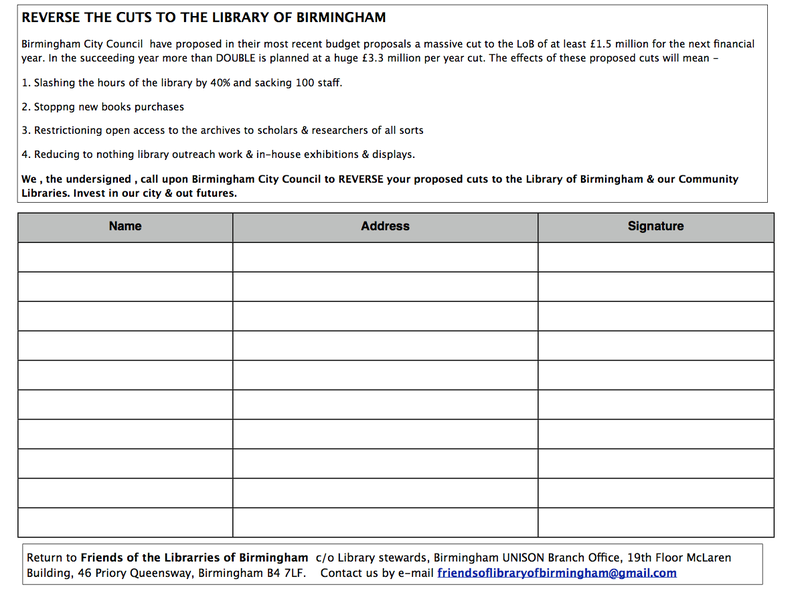 The Friends of the Library of Birmingham will support library users, staff and trade unionists who wish to oppose this new onslaught. We have campaigned tirelessly against the attacks on the city library service for several years now, organising public meetings, outdoor rallies, demonstrations, street stalls, petitions, responses to consultation (only to be ignored), press appearances, questions to Council meetings, letters and lobbying. All of this has identified overwhelming support for preserving our library service. It cannot be right that at every turn this overwhelming evidence of public support is met with rejection. We aim to see library buildings re-furbished, new books being bought and a modern flourishing library service be developed, complemented by an appropriate number of specialist librarians. This will not happen without serious campaigning and resistance. We have provided an example of what can be done and we now call on the city council to adopt a similar spirit. A good start could be made by them saying that the forthcoming consultation over the future of the city library service will proceed without the new cut of £1.9 million hanging over its head. 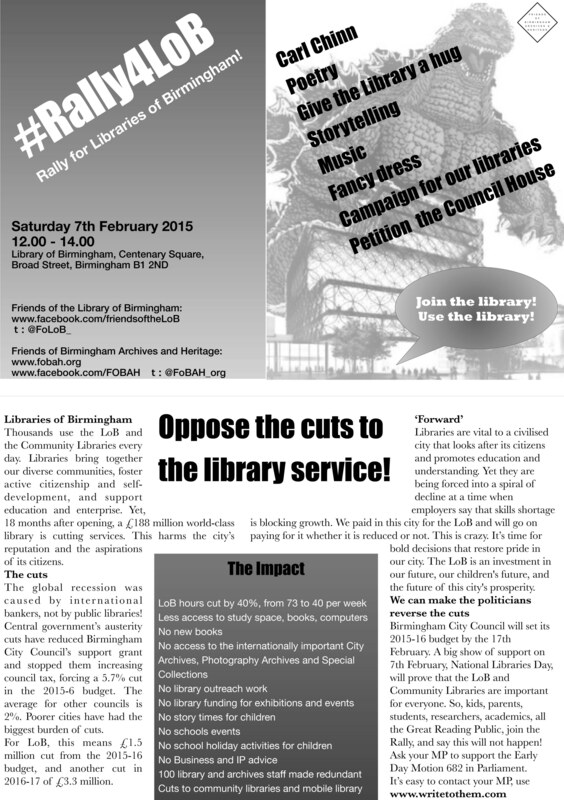 Our leaflet on the cuts to the Library can be downloaded below. Please print and copy. A petition for Spring Hill Library specifically can be downloaded at http://www.futurewise.info and also some pics of the inside showing it in use and its elegant character (coloured windows etc).